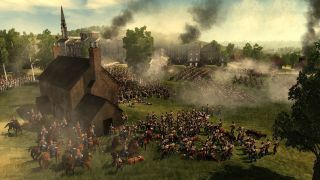 If you’re a fan of the Total War franchise, then you’ll doubtless be pleased to hear that Creative Assembly has unleashed a trio of new ‘Definitive Editions’ on Steam – and the good news is that existing owners will get a free upgrade to the new versions. Total War: Napoleon, Total War: Empire and Total War: Medieval II are the games which have had Definitive Editions announced, titles which were originally released in 2010, 2009, and 2006 respectively. So yes, these are strategic blasts from the past. The refreshed editions include all the downloadable content, expansion packs and updates for each game. Total War: Napoleon – Definitive Edition includes the Coalition Battle Pack, The Peninsular Campaign, Imperial Eagle Pack, along with Heroes of the Napoleonic Wars. Total War: Empire – Definitive Edition bristles with The Warpath Campaign along with the Elite Units of the East, Elite Units of the West, Elite Units of America, and Special Forces Units & Bonus Content. Finally, Total War: Medieval II – Definitive Edition simply includes Medieval II: Total War Kingdoms alongside the base game, and while that might sound a little paltry in comparison, bear in mind that this is the most ‘content-rich expansion’ ever produced for a Total War game according to the developer, comprising of four entirely new campaigns. All these freshly-unleashed offerings retail at £19.99 (around $25, AU$35) on Steam, but those who already own these titles on Valve’s gaming platform will be upgraded to the Definitive Editions and gain access to all these DLC goodies free of charge.